Less than two months after the Civil War effectively came to an end in Durham, North Carolina, 150 years ago next April, a newspaper editor headed out west publishing later in 1865, that region’s first travel guidebook. Long before that war began, every line of my ancestors back five generations, (except three who died along the way) some northerners, some southerners, along with two sets of newly arrived immigrants, (Scots and Brits) had settled in the western shadow of the Rockies, all but four a decade prior to that internal conflict. Samuel Bowles was traveling by stagecoach with the Speaker of the House of Representatives and future Vice President, Schuyler Colfax, on a journey requested by President Abraham Lincoln the day he was assassinated. Along the way they would pass some of the last two dozen wagon trains of Mormons still heading west. The subsequent guidebook was entitled, Across the Continent: A Summer’s Journey to the Rocky Mountains, The Mormons, and the Pacific States. The Civil War was over but the route Bowles and Colfax traveled was anything but peaceful. A general uprising by thousands of Plains Indians, Sioux, Cheyenne and Arapaho had been brewing for several years due to abuses by immigrants seeking fortune rather than a homeland, but warriors sometimes failed to make a distinction. Nor did Cavalry units protecting the Overland Route, which burst into open warfare after the tragic massacre of peaceful Native Americans a few months earlier at Sand Creek, mostly women and children. All along the stage route ranches, wagons, stagecoaches, telegraph wires and feed had been burned across Kansas and along the front of the Rocky Mountains midway through Colorado and Wyoming. Narratives about the transformative exodus of 80,000 Mormons between 1847 and 1868 in pursuit of religious freedom are obviously heavy on sacrifice, perseverance, suffering, faith and grit. But ironically, a new study by researchers at Brigham Young University looking into insurance rates provides some new perspective. The mortality rate for Mormon pioneers, while a point higher than the U.S. population in 1850 was only slightly higher for male pioneers and slightly lower for female pioneers overall. Showing that it may have been safer out on the trail away from cities, the mortality rate for babies on Mormon wagon trains was 9% compared to the U.S. population overall at 15%. Of course, only white mortality was measured at the time. Soon after Bowles published his travelogue, visitors began arriving to see Mormons, much as they do the Amish today, perhaps ironic to my Bowman ancestors who arrived in America as the latter and migrated west as the former. The first true “tourist’s guide” to the West was published as a resource five months after the first transcontinental railroad was opened in 1869, less than a decade after my ancestors settled the first permanent settlement in Idaho and forty years before they would prove up on their last homestead. Until then, tourism in America had been regional in nature. In the early 1800s coastal planters seeking the climate and scenery of North Carolina’s mountains were primarily motivated by fear of disease. Organized tourism took root first in New England by the 1840s just as my ancestors headed across the Great Plains. It was viewed as healthful scenic relief from industrial cities and factories. By the time a modest hotel clerk in Salt Lake City, a transplanted Virginian, first coined the term See America First, as the name for a three-day conference focused on tourism promotion, the first handful of community-destination marketing organizations had already been formed beginning a decade earlier with Detroit in 1896. Attending were 200 business leaders, governors, heads of commercial associations, agents for railroad and trails/good roads groups, including representatives from Spokane, Portland, Seattle, Tacoma, Victoria, Duluth, Denver, Vancouver, Colorado Springs and several towns in the Midwest. The meeting venue, now on the National Historic Register (the historic Oregon Short Track Building on Pierpont behind Ruth’s Chris Steakhouse and the Hilton, kitty corner from the Salt Lake Convention Center), at least deserves a plaque. While the movement fizzled, the slogan was soon picked up by the Great Northern Railway to promote Glacier National Park and then to promote all national parks and monuments as national assets. Watch for her new book, a co-edited collection of essays entitled Entangled Environments: New Perspectives on Rendering Nature in American Culture, due out this year. Scenic preservation and “nature” tourism took hold before, during and after WWI. From 1897-1915, most tourism was in the form of conventions and expositions because the idea of leisure travel would not emerge as mainstream until the late 1920s and early 1930s. Good road coalitions argued for a system of highway routes true to the historic pioneer routes such as those my ancestors blazed to honor them as emblematic of what it means to be American. Unfortunately, some cities didn’t get the memo when the proportion related to conventions and meetings began to rapidly decline by the 1930s, even battling until the early 1970s to prevent “visitor” from being added to the name of community marketing agencies. Some still obsess with conventions today when meetings of any type now represent only 7% of business and 4% of leisure visitor stays and 10% of travel overall about the same as attending performing arts, not insignificant but hardly worth the high risk of over building for. Increasingly after WWII, cookie-cutter development, franchise architecture, formula businesses and facilities, desecration marketing such as billboards, facility envy and mainstream culture have combined to demean tourism appeal, destroy sense of place and enable blight across the country. But as I was growing up in the 1950s, kids collected stickers about the destinations they visited and often displayed them on the rear corner window. 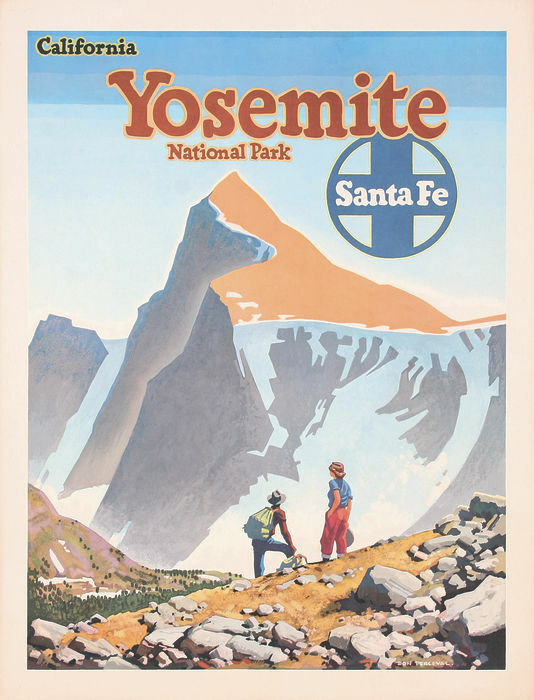 Along with others commissioned from artists such as the postcards at this link by railroads, then road associations, and for a time by airlines, they were used to promote tourism destinations. Little did I know in the 1970s as I backed my way into a life-long career in community-destination marketing in Spokane where businesses put on an exposition to celebrate nature that much of tourism across the nation had or was rapidly becoming anything but patriotic.